The New York City Police Department issues hundreds of thousands of small pink summonses each year. A wide range of offenses can be charged by way of these pink summonses. Most common among them perhaps are drinking in public, public urination, unlawful possession of marijuana, and trespass in a park after dark. This website is a resource of information for those who have received Pink Summonses in New York City but who are finding information about pink summonses difficult to come by. Start by watching the video presentation below about pink summons matters in New York City. This video introduction to the world of pink summonses and the options available was prepared by Don Murray, founding partner in the New York City criminal defense law firm, Shalley and Murray. Hiring a lawyer from Shalley and Murray for a pink summons provides an extra level of comfort and convenience. You probably won't need to appear yourself and you can rely on the advice and representation of an experienced criminal defense lawyer. Since pink summonses are relatively simple matters for an experienced criminal defense lawyer, the fee to appear and negotiate a settlement is a flat fee of $375 (trial fee would need to be negotiated individually). Read more about how a lawyer from Shalley and Murray can quickly, conveniently, and reliably help you get the best result possible for your pink summons. New York City aggressively tickets truckers and routinely sends these tickets to be heard in the Criminal Summons Courtrooms. More often than not these trucking summonses are written in the name of the Corporation that owns the truck and not in the name of the driver. This makes it the Corporation's problem. Shalley and Murray is a criminal defense only firm with more than 20 years experience in nearly every aspect of Criminal Courts in New York City, including the procedures in Criminal Trucking Summons matters. Our experience with Criminal Court and only Criminal Court makes us able to address these trucking summons matters with high efficiency and fixed, reasonable costs. And as a corporate officer responsible to the Corporation you can be confident that by sending a Criminal lawyer to Criminal Court, you have protected your corporation's interests. Read more about Trucking Summons Matters in New York City Criminal Courts. The New York City Fire Department aggressively monitors businesses for compliance with the fire code and will serve simple seeming pink summonses for fire code violations. Do not be fooled. These fire code summonses are heard in New York City Criminal Court, and corporations risk criminal convictions and breathtaking fines measured in the thousands of dollars. If your corporation is hit with fire code summonses sending it to Criminal Court, you need a Criminal Lawyer. Contact us right away. Bring a criminal lawyer to criminal court. This section of the site lists many of the most typical charges found in pink summonses, as well as discuss of their seriousness. You will be able to see the exact language of the offenses so that you know precisely what the charge means and understand more precisely what the accusation is. The number of possible accusations is enormous, but most pink summonses will probably charge one of these offenses. Some summons cases, for example, actually charge crimes, that could give the recipient a criminal record forever. Non citizens also need to be careful when accused of any offense, making legal representation prudent. People who hold professional licenses or are otherwise subject to periodic background checks may also discover that a summons is worth taking seriously. Finally, for those who are unable to appear on the date required, it is possible, under some circumstances to arrange for a lawyer to appear on the pink summons in your place. Little information is easily available for those with questions about pink summonses. Therefore, people are often left to rely for answers to questions from the police officer who gave them the ticket or from others who may have had summonses in the past. These are unreliable sources of information. As well meaning as the police officers may be, it has been our experience that they routinely provide misinformation to those they are giving summonses. For example, the police will often tell out of towners who are leaving well before the appearance date that they should "go to court the next day to advance the case". This is nonsense. It is impossible. It won't work. For reliable information regarding such common issues, review our list of frequently asked questions and reliable answers. Shalley and Murray is the New York City criminal defense law firm that provides the information for and maintains this site. To find out more about Shalley and Murray, or to learn how to contact a New York City criminal defense lawyer from Shalley and Murray, review the Shalley and Murray profile page. To learn about the broader criminal justice system in New York City in greater detail visit our main site for New York City Criminal Lawyer Information. 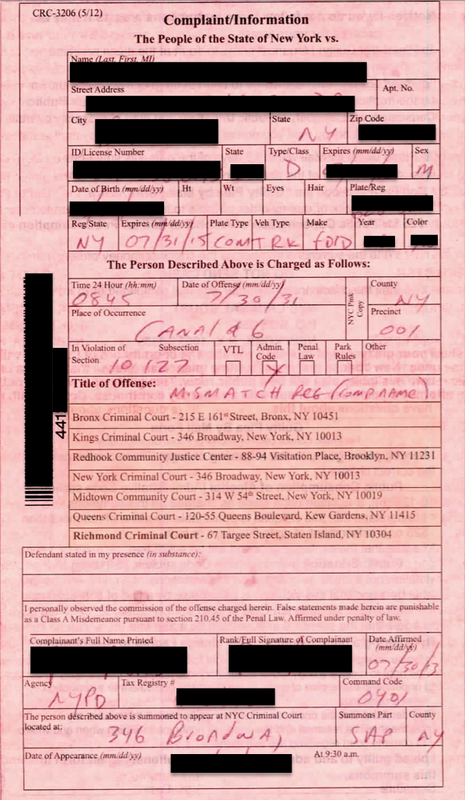 Typical New York City Pink Summons. Items have been blacked out to protect client privacy. The summons number will usually begin with "4" and is located usually at the left hand side where the bar code is located. The date of appearance and court is noted at the bottom. Evening Court, one of the recently enacted measures trying to make the summons system in New York City more user friendly is going to be eliminated in early 2019. Once a week, Tuesday evening, pink summons court at 1 Centre Street was available for people with open summons matters from any borough to advance and resolve pink summonses. The administration was convinced that the reason that many people failed to appear on pink summons cases was simply that they had to work and could not get off to come to summons court. Therefore, the court administration determined to open up Tuesday evening court to accommodate people who needed to work. The problem is that just about nobody showed up for the evening sessions. The content in this site is developed and sponsored by Shalley and Murray, a new york city criminal defense firm. Shalley and Murray is a private criminal defense law firm that can help with your pink summons case. Learn more about hiring an attorney from Shalley and Murray. We are not the court. We provide this site for free for people who need information about pink summonses. If you would like to contact us about helping you with a pink summons, call us or text us at 718-268-2171. Criminal Convictions Now Can Be Sealed in New York! If you have a New York criminal conviction that has been holding you back, you may now be eligible to have it sealed (starting in October, 2017). In fact, you can get up to two prior convictions sealed, including one felony. Convictions must be ten years old, or older, and there are other limitations. Call Shalley and Murray at 718-268-2171 now to explore this exciting new development. Learn more about about New York's new conviction sealing law. Find out how a lawyer can help you get your New York criminal conviction sealed.